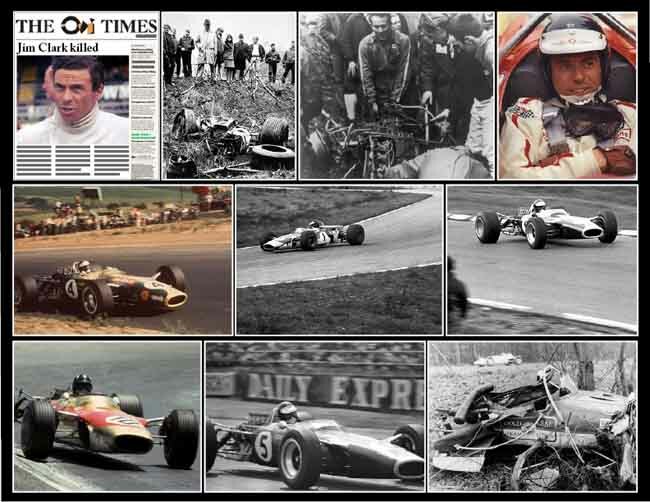 April 7th 1968; Motor racing world champion Jim Clark was killed in a car crash during a Formula Two race at Hockenheim. Clark, 32, was at the wheel of his Lotus-Cosworth which left the track at 170mph (274km/h), somersaulted through the air and collided with a tree on a remote part of the German track. The twice Formula One champion, who sustained a broken neck and a fractured skull, was dead before he reached hospital. The cause of the accident is not yet known although experts have suggested it could have been a fault in the steering mechanism or rear-axle suspension. Although it had been raining prior to the race, this is not thought to have caused Clark's car to skid.